We are a group that believes it is possible to articulate common aspirations, affinities and wishes in a more encompassing and organized way. 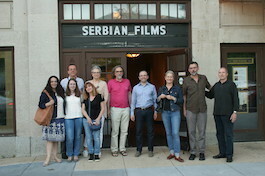 We are interested in live and contemporary Serbian culture and its interaction with other cultures: European, American and all other with which the Serbian cultural environment comes into contact. This does not exclude traditional values which we all carry with us, due to our education and our feelings, and which we try to preserve in the best and most contemporary way. 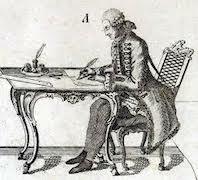 Zachary Stefanovich Orfelin (1726-1785) was the first Serbian bourgeois poet and artist. The scope of his interests led him from poetry and writing to engraving and the graphic arts. He was also the founder of the first journal among the Southern Slavs (Slavenoserbski Magazin). The geography of his human destiny extends from Novi Sad, Temisoara and Karlovac to Budapest, Vienna and Venice. Through his life and activities he appeared to us as an exceptional metaphor for our ideas and goals, as well as an illustration of ourselves, modern nomads and seekers in the world in which we live. We would like to organize cultural exchanges. This would include concerts, theatre performances, film festivals, art exhibitions, meetings with writers, lectures... The three dots are purposefully here as the process is open and ideas are not exhausted. Our spirit is also eyeing a library, a library for children and a media center. We are inviting you to become friends of The Orfelin Circle , to support with your ideas and in other ways this initiative. We live in turbulent times and think that a modest effort is the least that can be done in order to enhance reality. In the belief that children learn best by example, this is our attempt to offer them the most valuable of worlds and choices, and that is culture.